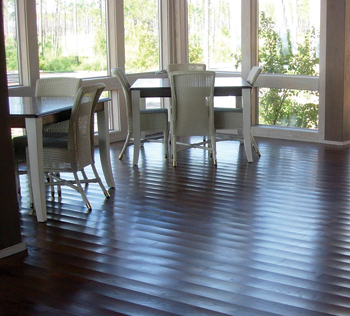 During the summer, even the most carefully installed wood floors tend to expand and sometimes cup or even buckle. These events occur because of wood’s relationship with moisture in the air. Air with a high moisture content (MC) or high relative humidity (RH) causes wood to gain moisture. When wood gains moisture, it expands. The result can be distortion, cupping and buckling. What can we do about it? To control summer-related expansion of flooring and associated issues, we can deal with the wood itself, or in some cases deal with moisture. Wood flooring basics, like proper acclimation, narrow boards, stable species, quartersawn configuration and possibly engineered flooring can help prevent summer moisture issues. This article discusses options for the environmental control of summer moisture issues. 4) Outside air contains moisture. Over the course of a typical day, mornings start out cool and humid. Sometimes mornings are cool enough to form dew on grass and car windshields. But by afternoon, the air warms, the RH drops and the dew has evaporated. At night, the air cools again, the humidity goes up and dew forms. The next aspect of summer moisture involves the temperature of the building. Buildings are commonly cooled with air conditioning (AC), making the inside temperature lower than outside (at least in the afternoon). Over the years, indoor summer temperatures in air conditioned buildings have dropped from the mid to upper 70s to nearer 70°F. I’ve been in several buildings recently that have been cooled to 65°F or 68°F. Soil under a building is often cooler than the interior. This cool soil helps cool slabs, basements and crawl spaces. Ductwork in basements or crawl spaces also helps cool the basement or crawl space. So we now have warm, humid summer air and cool indoor surfaces. Then add some moisture entry through crawl space or basement foundation walls, from exposed soil in a crawl space, or from activities in a building. Combine that with the fact that cooling air raises its RH, and we have a significant potential for issues with our hardwood floors. Our time-honored solution has been to ventilate these spaces to help control moisture levels. But there is a serious flaw in that thinking. When warm outside summer air enters a house and cools, the RH of that air increases. For example, air at 90°F and 50% RH, when cooled to 70°F, will be at 100% RH. (This air has a dew point of 70°F.) To get the RH of this air back down to something respectable, we would need to remove moisture. The more ventilation, the more moisture is getting into the house, and the more moisture we need to remove. So, reducing ventilation can be beneficial. Current building standards recommend home ventilation rates near 1/3 air changes per hour (ACH). Average homes have ventilation rates near 1-2 ACH, while some old, leaky homes are near 7-10 ACH. Weatherization and home energy audits typically measure ventilation rates, and can pinpoint leakage sites. Old windows are often major leakage sites, as are recessed lights and other holes in ceilings and floors. Using charts published by the American Society of Heating, Refrigerating and Air Conditioning Engineers (ASHRAE), we created Table 1 showing how much moisture needs to be removed from a house with different air and different ventilation rates. According to this table, about 7.4 pints of water per hour needs to be removed from an 1,800-square-foot house to lower the inside RH to 50% when the outside air dew point is 70 degrees. If the ventilation rate is higher, even more water needs to be removed. If it is colder or warmer outside, the amount of water to be removed changes. This same house, if located in Duluth, Minn., may not need any moisture removed during the summer because of the cooler, drier summer air. A house in Las Vegas may even need to add moisture in the summer because of its hot, dry air. As you can see from Table 1, warmer outside air requires more moisture removal. Higher ventilation rates require more moisture removal, and lower target indoor RH levels require more moisture removal. Since the ventilation rate and moisture removal are related, an economical solution is to reduce ventilation rates before attempting to remove moisture. Moisture is removed from indoor environments by two main mechanisms. First, ventilation with dry air can help dry out a house, but this air must be cold to be dry enough to be helpful. A dew point of near 60 degrees is about the cutoff where ventilation with outside air starts adding moisture to your house. In other words, if the dew point is below 60 degrees, venting will help dry your house. If the dew point is above 60 degrees, venting will add moisture to your house. So except for some arid or cool parts of the country, venting to dry a house in the summer is not a feasible solution. If you are lucky enough to live in one of these parts of the country, summer venting can help dry your house, but winter venting may really dry your house. The main option for removing moisture is to use a mechanical system. These systems can either be air conditioners or dehumidifiers. A typical air conditioner uses about 25% of its energy to remove water from the air. A 3-ton air conditioner can remove about 9 pints of water per hour, when it’s running wide open. But—and it’s a big but—an air conditioner only removes moisture when it is running. A properly sized AC runs wide open about 1% of the year. The rest of the time, it won’t remove 9 pints per hour. I mentioned that a properly sized AC runs wide open only about 1% of the time. One problem common to an AC is oversizing (that is, installing one bigger than needed). An AC is controlled by temperature. Once the indoor temperature is good, the AC shuts off. But moisture is removed only when the AC runs. An oversized AC will cool the house quickly, but because it doesn’t run very long, moisture removal isn’t good. AC manufacturers have helped this situation by making variable-speed equipment that runs longer. More run time means more water removal, but in many situations in the Southeast, this extra removal still isn’t enough. AC fans: Another quirk with AC systems is that there are actually two parts: the fan, coils and duct work that blow cold air throughout your house, and the outside unit that makes the cold. Typically, when the thermostat says “house needs cold,” the outside unit and the indoor fan turn on. As indoor air goes through the coil, the air is cooled to the dew point, and water condenses on the coils and drains out. This is how an AC controls humidity. Thermostats have a switch that lets you set the fan in the “ON” position. This keeps the fan running even when the outside unit is not making cold. When the outside unit stops making cold, the coils warm up. Condensation that is still on the coils evaporates back into the house air, rather than draining out. A bunch of your humidity control is lost, and RH levels can go up. Dehumidifiers: The best solution for real humidity control in many buildings is a central, or whole-house, dehumidifier. Good systems put close to 100% of their energy into removing moisture, and can handle up to around 6.5 pints per hour, every hour, regardless of mild weather or cool mornings when an AC won’t run much. They will also shut down when an AC can handle the moisture loads. And since dehumidifiers turn on and off because of humidity levels, oversizing an AC or even leaving the AC fan in the “ON” position becomes less of an issue. Portable dehumidifiers can also help, but they typically don’t remove much more than about 2 pints per hour, and they use more energy than a good whole-house dehumidifier. Since they are usually located in one room, humidity control in other rooms or the whole house may not be good. Basements: Since lots of surfaces in basements are cool, an AC won’t run much. Many times I can’t even find a small enough AC to get good run time in a basement. So basements are prime candidates for dehumidifiers. Crawl spaces: Crawl spaces are like short basements, only sometimes they have more ventilation. Venting very often makes a cool crawl space not just humid, but wet. Temperature doesn’t matter in a crawl space, so an unvented crawl space with a dehumidifier is a great, efficient way of controlling humidity levels below wood floors that are over a crawl space. Go back to the basics. Acclimate the flooring properly. Use narrower boards, more stable species of wood, quartersawn boards, or a combination of those features. Deal with concrete slab moisture by using appropriate flooring-approved vapor barrier membranes or systems. Accept some gaps. This takes consumer education by establishing proper customer expectations. Make sure you explain clearly, and hopefully in writing, that the 7-inch hickory flooring for a house in Florida will likely have seasonal gapping if you install it so that cupping does not occur in summer months. Use a product that can handle high-RH environments. Solid wood flooring has been used in variable environments for years while, based on warranties, much engineered flooring and some factory finished flooring apparently aren’t designed for those environments. Don’t set your client up for automatic failure, or an extra unknown expense. Deal with the building environment. These solutions (reducing ventilation, controlling water in crawl spaces or basements, adding dehumidifiers or modifying AC systems) aren’t up to flooring professionals. Building owners can take steps to reduce ventilation rates, reduce moisture intrusion and/or add mechanical dehumidification. But don’t expect them to install $20,000 worth of extra climate control or building modifications for $2,000 worth of flooring.